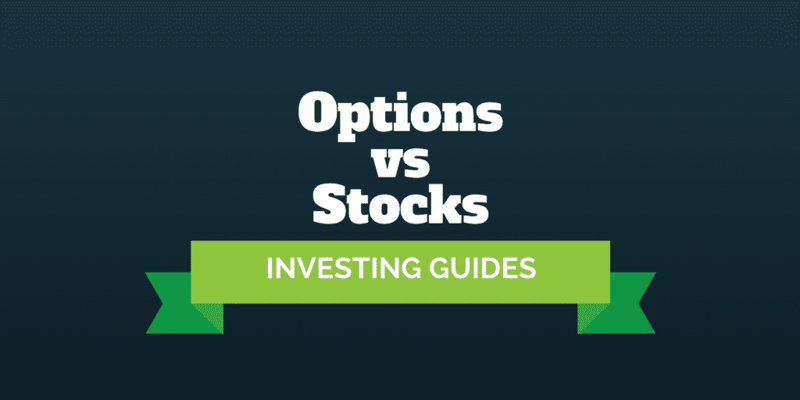 Home › Investing › Options vs Stocks: Which Should You Choose? Options vs Stocks: Which Should You Choose? Options vs stocks, which should you choose? You might be forgiven for thinking that stocks win hands down. After all, stock investments are one of the primary ways that Warren Buffett got so rich. But options give you flexibility that stocks don’t, and they can be especially useful during stock market downturns. So which is best? When Should You Invest In Stocks? What Are The Risks When Investing In Stocks? What Are The Risks When Trading Options? Options Vs Stocks Trading: Which Is Better? If you are new to investing, stocks are a better bet. When you invest in stocks, you own shares in individual companies. One of the most famous stock market adages is to invest in companies you know. You probably log onto Facebook daily, search for information on Google, and watch streaming movies on Netflix. By purchasing shares in such companies, you get to ride on their coattails of success. Like many famous and successful investors, you can hold onto stocks as long as you wish. In contrast, options will expire eventually, so they need to be monitored more often. The nice thing about stocks is if you have a long term view, you can virtually forget about them after you buy them. Although share prices will rise and fall from one day to the next, and generally experience above average volatility each quarter when management teams report earnings, history shows that the investing in stocks for the long-term is a winning bet. There is no free lunch when you invest in the stock market. While the chances of cash-rich companies, such as Alphabet and Microsoft, going broke is almost zero, the risk of a share price dropping all the way to $0 if things go seriously awry is real. During economic downturns, companies with heavy debt loads and low cash levels often run into solvency challenges when revenues dry up. So, when you pick a company whose shares you want to buy, focus on the strongest companies that have a history of growing over time. If you do a good job picking strong stocks, you will need to keep in mind that selling a stock that has had a good run can result in capital gains taxes. As long as you have held a stock for more than a year, you will generally enjoy more favorable tax treatment than if you bought and sold over a period of less than 12 months. Plus, you should be wary of buying and selling too often, not only because capital gains taxes are higher but also because trading commissions costs can add up in a hurry. Although top stock brokers, such as TD Ameritrade, charge competitive commissions the reality is even if you pay a small amount many times over it can add up to hefty expense at the end of the year. While owning stocks makes you money when share prices rise and dividends are paid, options give you a lot more flexibility to make money. Whether share prices rise, fall, or even stay flat, options offer you the potential to make money. However, all options expire at some point in the future so you need to be a more active trader if you want to add options as a “string” to your investing bow. Generally, options traders track share price movements more closely than buy-and-hold investors, and frequently look to take advantage of shorter term stock market movements. Options trading platforms, such as tastyworks and thinkorswim, provide excellent tools and dashboard views to help options traders keep tabs on positions and take action in a heartbeat if needed. Where options first get tricky is learning the jargon. Unlike stocks which you can buy, sell, or even short, options come in two types, calls and puts, and you can both buy and sell them to open or close trades. When you look under the hood, options can be mesmerizing with new terms to learn like delta, gamma, theta, and vega. But once you get a hang of these options greeks that form options trading basics, a world of options – excuse the pun – opens up. When you understand how to use options, you don’t have to be a short a stock to make money when a stock falls. For example, buying put options ahead of a stock market crash can be highly lucrative and much less risky than shorting stock. While options trading strategies, such as married puts, can help you to lower risk compared to owning stocks and options can pay you a regular income stream – using covered calls – they can also expose you to a good deal of risk if you don’t know what you are doing. Selling naked calls, for example, is considered a highly risk strategy and best avoided by beginners especially. Because options trading naturally lends itself to shorter term trading, short term capital gains taxes are common and generally quite a bit higher than the taxes paid on gains by long-term oriented buy-and-hold investors. Plus, you generally need to have a good sense of timing the market when you buy options. Because option values lose premium due to a factor called time-decay, it is not sufficient to simply buy options and hold them. You must be right not only in the direction a stock goes but also in timing share price movements. When you compare options vs stocks, the choice boils down to your own personal investing style and trading preferences. If you are new to the stock market or favor a hands-off approach to growing your wealth then stocks are the better bet. However, if you like the idea of proactively generating income, protecting stock holdings, and leveraging your money to capitalize on stock market movements, options are well worth exploring – though you will probably need to monitor the market more actively than an average stock investor will be required to do. Stock investors can hold positions for longer which generally means lower capital gains taxes and commissions costs. While options traders may well be able to generate superior returns from the same movement in a stock. The bottom line is if you are happy to sit back and let the market do its thing, stocks are a better choice but if you are keenly glued to share price movements daily and want more flexibility to take advantage of the stock market then it is probably worth your time getting up to speed on the risks and benefits of options. If you were to choose options vs. stocks, which would you select and why? ‹ Do You Save More In States With No Income Tax?